The quest to secure Middle Eastern oil and the wars in Iraq and Afghanistan consume much of the foreign policy establishment in Washington today. But in the next decade, more of the U.S.'s attention will shift to the new Middle East: China. Economists have been predicting this shift for decades. China is already the world's top manufacturer, top auto market, top cement producer and top polluter. Its military and naval capacity is growing. Its construction-driven hunger for natural resources, especially timber and energy, is reshaping the landscapes of Africa, Southeast Asia and South America. Experts may argue about the pace of China's economic ascent  Nobel laureate economist Robert Fogel predicts that China's economy will be an eye-popping 40% of global GDP by 2040, while others project somewhat more modest growth  but few question that it's happening dazzlingly fast. Some see a threat to our way of life in China's rise. Martin Jacques, author of When China Rules the World, imagines the rise of China toppling the cherished Enlightenment principles of the West. Others persist in using faulty cold war analogies, substituting China for the old U.S.S.R.
Rather than being cold war adversaries, however, the U.S. and China will form an indispensable axis for global governance. That doesn't mean the two will be best friends  don't expect a new special relationship similar to the U.S.-British alliance of the 20th century. 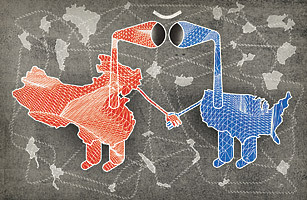 There is no precedent for this unique evolving relationship, one in which the two sides will both compete and cooperate, perhaps simultaneously, as they shape and support a global system they can benefit from. In some ways, this axis might resemble the fluidity of the G-8, the group of industrialized countries that cooperate on economic issues where they share interests but go their separate ways on issues where they don't. Washington and Beijing will increasingly be the 800-lb. gorillas in multilateral architectures like the G-20 or Asia-Pacific Economic Cooperation while developing a shifting bilateral relationship, working together closely on some issues and hampering each other's unilateral actions on others. But this is not a marriage of equals. The U.S. remains the unchallenged predominant global power. Certainly, China is becoming more influential economically, and its military is increasing its capacity. But it has little ability to project force beyond its borders, and Beijing has shown little interest in supporting or paying for the global commons that underpins the world economy. For now, China prefers to be largely a free rider on the international system that helps safeguard trade routes, sea lanes and relative regional stability  allowing Beijing to focus on pressing domestic challenges. At the Copenhagen climate conference in December, China had a chance to assume a greater leadership role, but Premier Wen Jiabao at crucial moments preferred not to meet directly with President Obama. Beijing appears not yet ready or willing to be a world leader. So don't expect smoke-filled summits on par with Yalta in which the leaders of two superpowers decide the world's fate. Instead, we can expect a much more ad hoc, varied and fluid relationship managed within multiple forums, both domestic and international. China will continue to flex its muscles and pursue its interests  including seeking oil, timber and mineral resources in far-flung corners of the globe as it strives to maintain high growth  in ways that will at times unsettle Americans. Yet the U.S. is not seeking to contain China's rise, nor can it feasibly do so. The real challenge for Washington will be structuring a relationship that encourages China to support the global commons that it benefits from. That will require our leaders to manage the complex partnership in a clear-eyed manner and not be consumed by the temptation to either coddle or demonize the world's next superpower.